Living in the US, I’d seen plenty of those “Old West” dress-up studios, but I never ventured inside. I thought they looked like fun but I also felt they were too much of a “touristy” thing for me to do. Luckily for me, here in Istanbul, I am a tourist! I’d seen photos of travellers in Turkey who had stopped in a studio to don old Ottoman costumes and I could just envision myself in a harem setting one. I was really excited for this experience, and I’m so happy I went to Giyçek Nostalgic Photography Studio in Galata! It was exactly what I had imagined and so much fun. Giyçek Studio is located on a cute street in view of the Galata Tower. It’s nestled between hip cafés and trendy clothing shops. The building itself is spacious and very tastefully decorated. Photos of past happy customers hang on the wall behind the desk and the colorful display of all their old hats is so inviting, you can’t help trying a few on. There are many different packages available depending on the number of people, the number of costumes, and how many prints you want. Prices start at just 50TL for one person. The options for costumes have two general themes: either the 1850s military look, or the old Ottoman Sultan style. I took my cousin and we chose to just have one costume each - harem girls of course! My favorite part of the experience was dressing up (yes, I’m totally still a 6 year old). We got to pick from an array of sparkling gowns and slippers. I chose a golden dress and my cousin wore a purple piece that included a dress and a long shawl. Then came the jewelry. There were clip-on earrings and huge fake rings galore. My cousin and I were both completely obsessed with the jeweled head pieces we donned. Does anyone know where I can buy one? The photoshoot itself was really fun, we got to try lots of different props and poses. The photographer had some suggestions for us, but we were also completely free to try out our own ideas. 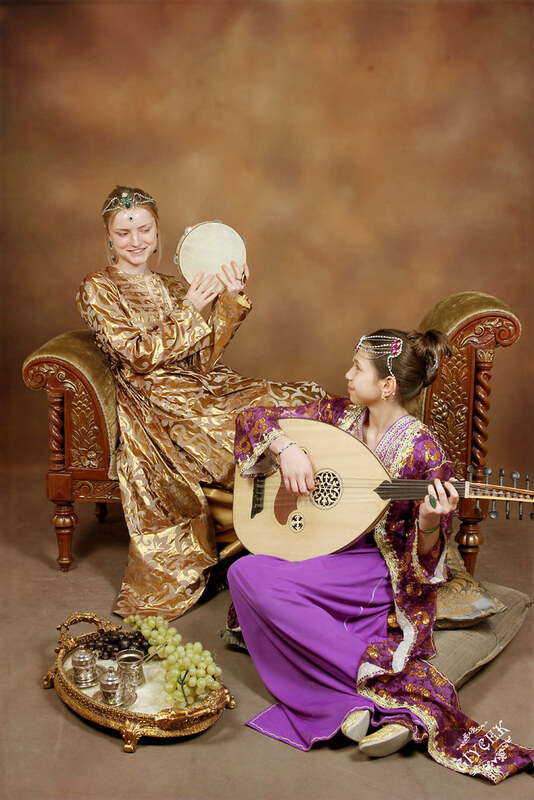 We sat on pillows and used different props like a tray of coffee, grapes, tambourines, and the oud (a string instrument). My favorite photo is one of us eating grapes with our heads tilted back. The photos were all so funny that the most difficult part was choosing which ones to get printed! The photographer put all our photos on a slide show so we could say trash or keep as they came up. As we looked through our photos we couldn’t keep from cracking up, and we decided to choose the most humorous photos. After choosing the prints, we reluctantly returned the head pieces and gold shoes, but walked out of the studio with smiles on our faces, clutching four beautiful photographs and knowing that we had created a great memory.